Welcome to the IWW eJournal October 2014 issue. Welcome the new writers - Enakshi Johri, Anita Bhattacharjee, Abinaya Natesan, Manasa A and Manal Pednekar who have joined IWW team, with their contributions. Wish you all a Happy Navaratri festival. This issue comes to you with an important message. 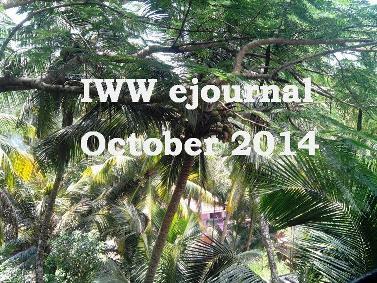 We regret to inform you that the IWW eJournal will be discontinued temporarily after this issue, and there will be no issue from next month onwards, until further notice. However, the monthly iww newsletter will be continued as usual. You can also submit your work as usual. The accepted work will be published within 10 days, and they will be included in the IWW newsletter so that the subscribers will get to know the newly published work. If you have any comments/questions please contact us.